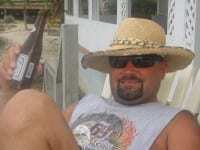 When most fishermen think of tarpon, they think of fishing the open ocean or reef flats. 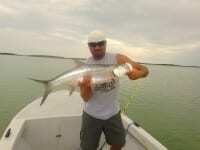 Our tarpon move around. Some mornings we find the big boys a few miles offshore, hanging out and waiting for a tasty fly. The sea’s surface is smooth as glass, reflecting the nearby Maya Mountains. 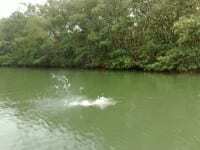 Then they explode out of the blue water, tail dancing across the surface. When the tide changes, they come up the Manatee Bar River in groups to the incredibly rich feeding grounds of the Southern Lagoon and its many tributaries. 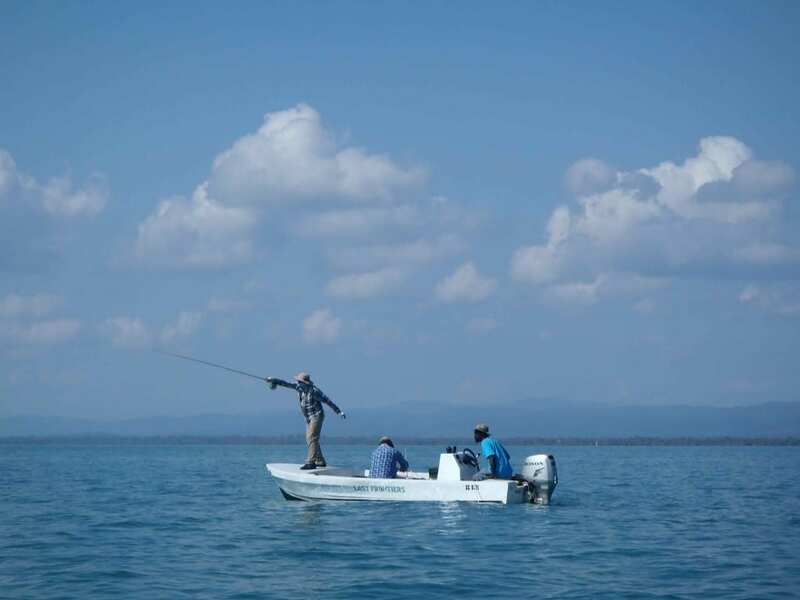 Our fishing grounds are thousands of hectares, with 7 jungle rivers feeding into this vast estuary, surrounded by some of the most pristine habitat on earth – truly one of this planet’s “last frontiers”. 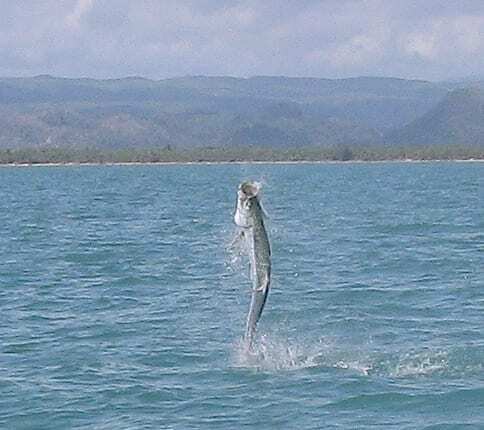 In February & March, the tarpon come far up the rivers and creeks to spawn in fresh water. Throughout the year, they can be found in all sizes, in the tidal rivers and seaside lagoons – even land-locked in freshwater jungle creeks! 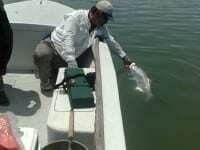 It is not unusual to catch ‘baby” tarpon of 30 lb. 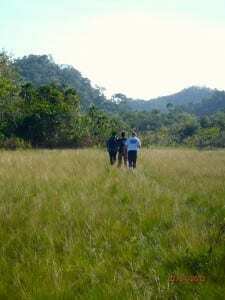 or more, far up one of our jungle creeks, several miles from the Caribbean Sea. 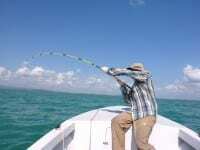 In this wild environment, tarpon and other saltwater gamefish such as barracuda, jack, permit and snook, can be fished with a fly or with spinning gear. It is quite a thrill to hook one of these top predators and watch it dance on top of the water, way back in a jungle creek barely wide enough for a boat to navigate. These babies are not shy! 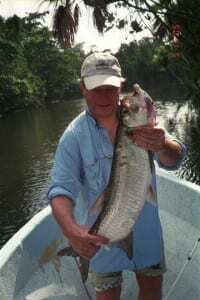 Not far from our lodge, via a mile-long hike across open savanna and into dense jungle, there are several freshwater creeks where tarpon come early in the dry season to breed and feed. 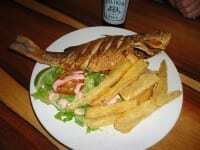 That’s right— freshwater tarpon! These fish swim far upstream, in one case through an underground stream, into totally freshwater jungle creeks, some barely 8 meters wide. Because of the hike and the tight quarters, we pack light and use lightweight gear. Don’t believe it? See for yourself, we will make a believer out of you, with howler monkeys and parrots as witnesses. 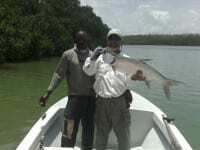 In Belize, tarpon are strictly catch and release. 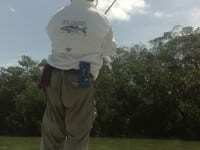 Of course, hanging around under the mangrove within the deep Manatee Bar River , and also a short distance out to sea beyond the river mouth, we encounter the classic ‘big boys’ – tarpon bigger than your children – just waiting for your perfect cast. What a joy it is seeing these beautiful fish ‘tail dancing’, trying to shake loose your lure, break your line, or straighten out your hook.